Even as the most committed of fans to Link’s grand scale escapades, when his next Nintendo 3DS exclusive adventure had first been announced during May’s Nintendo Direct I was less than enamoured. It was a semi-reveal, of sorts. Nintendo’s card hand was incomplete, with no finalised title, inconsequential conversation that it would be a sequel to The Legend of Zelda: A Link to the Past, and a 3D trailer released through the Nintendo eShop that really didn’t do enough justice to just how luscious the game truly looks in the palm of your hands. Thank the Hylian Gods, then, that those vital news nuggets emerged from Nintendo’s E3 2013 coverage, the company hastily scrambling to convince devout pot-smashing fans as to why Link’s latest should be a permanent blip on their gaming radar. As with The Wind Waker HD, A Link Between Worlds delivers a nostalgia trip. Whereas the Great Sea receives a whimsical high definition upgrade to its cel-shaded art style, A Link to the Past’s Hyrule is incandescently transformed through the handheld’s stereoscopic 3D. For many, The Legend of Zelda remains a connection to their gaming childhood, and none of that classic style has been lost here. Players will gleefully watch as Link carelessly runs through Hyrule field with reckless abandon, navigation of his familiar surroundings feeling entirely fresh with the Hylian-born saviour no longer transfixed by the rigid movement of his SNES counterpart. Hyrule’s iconic landmarks remain in their prior locations – for those familiar with A Link to the Past at least – except now loom tall over the landscape, additional depth to the top-down view granting an entirely different perspective to Nintendo’s carefully crafted world. The sprawling dungeon that we were warily allowed to wander through served to showcase just how well Nintendo have been able to leverage their handheld with A Link Between Worlds to exploit the 3D visuals. The demo’s 10-minute time limit barely proving enough of a window to navigate your way through in entirety, although soon became possible on repeat runs having deduced its secrets. 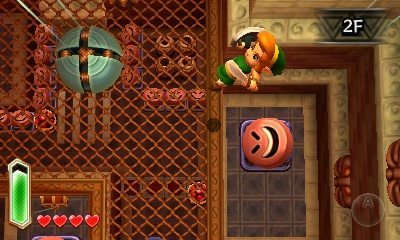 What’s perhaps most exciting is how new gameplay possibilities stride away from incredibly well-worn puzzle structure, largely made possible by Link’s peculiar ability to stylishly etch himself on walls at a mere button press. Players must therefore think outside the confines of tradition – sliding along walls so that they can sneak through barred windows, positioning themselves on moving platforms to ride between dungeon floors, or simply dodging incoming projectiles. It’s neat, entirely unexpected, yet the creative experiences that Nintendo have become known for delivering. Combat’s largely as can be expected, with familiar enemy types making their return to thwart your progress. Though it is Link’s array of items and weaponry that continue to expand the series in new directions, albeit paths that perhaps only the Nintendo 3DS can pursue. Most prominent was a monstrous hammer that can squash rubber faced-switches that, once stood on, propel Link toward the screen and to a higher floor – this particular dungeon having 13 levels. Whereas wandering Hyrule Field saw us handed a magic staff that conjures plumes of flames to burn foes to a crisp. 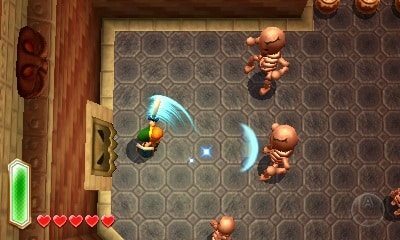 Use of such items is governed by a returning magic meter, which automatically refills over time but is also consumed when Link turns himself into a painting. Map navigation and item management remain a far speedier process, Nintendo taking inspiration from that achieved by Grezzo’s successful Ocarina of Time 3D remake. These are integrated through the 3DS touch screen, where items equipped are clearly designated as relevant to either the X, Y or B buttons, whereas holding L automatically draws your shield. What’s great is that there’s still so much that remains unexplained. The “big surprise” during the game’s opening that series producer Eiji Aonuma has only been more than delighted to tease, precisely what is hidden behind the game’s subtitle, and that darkened Triforce within its logo. I’m feverish with anticipation simply thinking about discovering everything this has to offer. Whilst Nintendo may be steering their resources to stimulate interest in the Wii U this Christmas, A Link Between Worlds demonstrates clear intent by the company that it is imperative the Nintendo 3DS similarly receives stellar software to tuck away beneath the Christmas Tree. A shining beacon of Nintendo’s commitment to delivering unique experiences spun around tried-and-tested formula, if this fails to resonate with enthusiasts then that most certainly be a great shame indeed.